For Patek Philippe, the launch of a new hand-wound chronograph movement developed and crafted entirely in-house is a further manifestation of the manufacture’s independence and spirit of innovation. The traditional column-wheel-controlled CH 29-535 PS caliber proudly shows off its roots, standing out with several innovations and patented improvements that optimize the chronograph’s functionality and reliability. As an elegant tribute to the feminine mystique, this exceptional movement will first tick in a wristwatch chronograph dedicated to premiere as a ladies’ model. 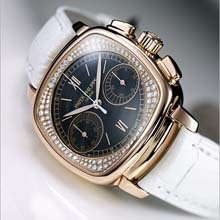 Hence the name “Ladies First Chronograph”. It begins a new chapter in Patek Philippe’s longstanding commitment to ladies’ timepieces. At the same time, it ushers in a new, long awaited era for all enthusiasts of mechanical chronographs. The CH 29-535 PS caliber and the Ref. 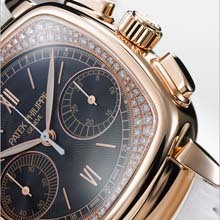 7071R “Ladies First Chronograph” had their debut in Paris in early November. The inauguration of the new Patek Philippe showrooms on Place Vendôme – totally renovated and remodeled in the past months – was the welcome occasion. Within the extensive portfolio of complications that demonstrate Patek Philippe’s virtuosity in timekeeping, the chronograph has always played a pivotal role. With many patented technical innovations to its credit as well as its continuous quest for combining performance with refined and understated aesthetic appeal, the Geneva-based manufacture has evolved to become one of the most respected makers of this comparatively technical category of timepieces. Born in the 1820s, chronographs today are perfect icons of our modern era. In the second half of the 19th century, Patek Philippe was already crafting unique pocket chronometers with and without split-seconds hands. The mechanisms for the measurement of short time spans were often merged with other refined complications such as a perpetual calendar or a minute repeater. This was the case in two watches presented in 1878 at the Paris Universal Exposition, where the manufacture was awarded a gold medal. In 1893, the company received a patent for a minute-counter isolator mechanism. In 1902, this was followed by a patent for a “double chronograph” with a second mechanism – also called rattrapante – that allowed the concurrent recording of a series of time measurements of different durations. In 1904, Patek Philippe was granted a patent for an instantaneously advancing minute-counter mechanism. When the wristwatch gained popularity during the 1920s, Patek Philippe was a trendsetter in the miniaturization of the chronograph. In 1923, the company created a split-seconds wrist chronograph on special order, the first of its kind in the world. Starting in 1927, wrist chronographs with and without split-seconds hands were added to the schedule of regularly produced watches. Their Art Deco cases appeared in many different forms: round, square, rectangular, tonneau, and cushionshaped. The chronograph calibers were based on exclusive movement blanks produced by the best artisans, masterpieces of technical and aesthetic perfection in their own right. For Patek Philippe, the 1930s were the golden age of wrist chronographs. The collection included eleven references for simple chronographs, among them the acclaimed Ref. 130 introduced in 1934, as well as three split-seconds chronographs. In the community of collectors, these pre-war chronographs are highly coveted Patek Philippe timepieces and regularly fetch record prices at international auctions. During the 1940s and 1950s, this fascinating collection continued to evolve. Often, the chronographs were endowed with additional complications such as perpetual calendars, and many timelessly classic versions were presented, including the Ref. 1463 in a water-resistant case. In 1986, Patek Philippe opened a new chapter in its chronicle of chronographs by presenting the famous manually wound caliber CH 27-70 based on a Nouvelle Lémania movement blank produced exclusively for Patek Philippe and completely reworked in the manufacture. In 1996, the workshops received a patent for a split-seconds chronograph mechanism with an isolator catch that totally eliminated rate accuracy deviations when lap times were stopped. In 2005, Patek Philippe attracted considerable attention with the thinnest split-seconds column-wheel chronograph movement ever made. The hand-wound caliber CH R 27-525 PS, of which only a few are produced each year, was the first chronograph movement developed and manufactured entirely inhouse. Only one year later, the manufacture delighted patient enthusiasts with the launch of its first totally proprietary self-winding chronograph movement: the CH 28-520 IRM QA 24H with the patented Annual Calendar. This year’s launch of the CH 29-535 PS movement is the reward for five years of development work. It is also an important milestone for the workshops which now have a new manually wound chronograph movement designed and manufactured entirely in-house. To arrive at this point, Patek Philippe had to mobilize the full breadth of skills and experience of its team to devise an exceptional mechanism that matches and in many instances exceeds the CH 27-70 movement – still deemed by connoisseurs and aficionados as the most beautiful traditional chronograph caliber ever made. 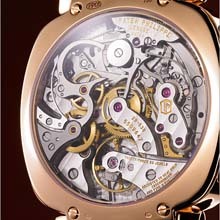 But the effort has paid off: the CH 29-535 PS is a worthy successor of the legendary movement. With its flawless technology and artisanal finish, it is a perfect ambassador of Patek Philippe’s uncompromising quality philosophy. Additionally, the CH 29-535 PS creates fresh latitude for further developments and a new generation of wristwatch chronographs with and without extra complications. As a traditional chronograph movement, it will gradually replace the current (Nouvelle Lémania-based) caliber CH 27-70. The CH 29- 535 PS is an important enrichment of the portfolio of Patek Philippe movements which now encompasses 21 basis calibers with a total of 45 different versions. The CH 29-535 PS is based on the principle of the column wheel, no doubt the defining hallmark of truly beautiful mechanical chronographs. At Patek Philippe, it is crowned with a polished cap. The watch has a large chronograph hand, a seconds sub-dial, and an instantaneously jumping 30-minute counter. Its large four-spoke Gyromax balance wheel with four poising weights beats at a frequency of 4 Hz (28,800 semi-oscillations/hour). The caliber has a power reserve of 65 hours (58 hours when the chronograph is activated). The clutch lever exhibits the classic “S” shape. The aesthetic design vocabulary also extends to the chronograph wheel bridge and the minute-counter bridge. The movement has a stop-seconds feature that makes it very convenient to accurately synchronize the watch with an official time signal. Even though the CH 29-535 PS movement is based on the classic architecture of column-wheel control and a geared clutch system, it is a brilliant masterpiece that unites six patented innovations – each one is a manifestation of the workshops’ inventive spirit. The caliber engineers examined all of the essential components of the chronograph mechanism and embarked on the quest for new solutions that would improve precision, reliability, longevity, and convenience. Their focus always remained on functionality and user-friendliness as stipulated by the principles of horological artistry and by the Patek Philippe Seal. The development of the CH 29-535 PS movement culminated in six patents and patent applications that represent the latest advances in chronograph technology. The wheels of the chronograph mechanism feature an exclusive patented tooth profile (presented for the first time in 2005 when the ultra-thin caliber CH R 27-525 PS split-seconds chronograph was launched). It eliminates the risk of hand jump in both directions when starting a measurement, limits chronograph hand quiver, increases energy transmission efficiency, and reduces friction as well as wear in the movement. The adjustment between the teeth of the clutch wheel and the teeth of the chronograph wheel is performed by a large eccentric column wheel cap, working directly with the tip of the clutch lever instead of the conventional eccentric placed next to the clutch wheel. This new system enables a more precise adjustment of the penetration between the clutch and the chronograph wheel. Ordinarily, the clutch lever and the blocking lever are synchronized by the column wheel. The engineers of the CH 29-535 PS eliminated this intermediate step by fitting the clutch lever with a finger piece that directly synchronizes both the clutch lever and the blocking lever. This solution simplifies and improves the precision adjustment of the control sequences because the watchmaker only has to adjust one point instead of two as was the case in the past. Moreover, this approach suppresses jumps of the chronograph hand when time measurements are started and stopped. A new minute-counter cam was created with a slot to prevent abrupt blocking in response to the reset command and therefore considerably reduces hand quiver. The reset hammers of the chronograph are equipped with a self-setting system that makes it unnecessary to mechanically adjust the minute hammer function and thus increases the reliability of the mechanism. The engineers provided separate bilaterally jeweled bearings for both the seconds and minutes hammers on the same axis. Each hammer is pressed against its respective heart cam with its own spring. This system assures that the hammers remain precisely aligned in the vertical direction and improves the smoothness of their rotation. The architecture of the CH 29-535 PS movement also exhibits a number of other remarkable features that have just as positive an impact on its functionality and performance as the six patented inventions associated with the development of the new chronograph movement. One of them is the instantaneous 30-minute counter that is much more difficult to engineer than a semi-instantaneous or continuous counter. This clever device advances the small minute hand within fractions of a second, resulting in greater accuracy and clarity of the reading. Another example is the driving wheel of the chronograph: it is integrated directly in the train and does not need to be separately assembled by the watchmaker. This construction improves the reliability of the chronograph functions. The new CH 29-535 PS caliber combines Patek Philippe’s ancestral know-how with latest-generation patented technologies. These innovations allow the watchmaker to focus on refining functionality and on achieving high-precision rate accuracy. This not only addresses customer expectations but also assures compliance with the strict precision criteria of the Patek Philippe Seal. • For calibers with diameters of 20 mm or more, the rate accuracy must lie within the range of -3 and +2 seconds per 24 hours (rounded to integers). As befits Patek Philippe’s heritage, the CH 29-535 PS presents itself as a new point of reference for aesthetic appeal and artisanal workmanship. Its salient features include captivatingly elegant components and old-style bridges that are meticulously chamfered, polished, and decorated with Geneva striping. Every surface, no matter how small, is beautifully finished in numerous consecutive steps, most of them manually executed. And in compliance with the criteria of the Patek Philippe Seal, none of the movement embellishments interfere in any way with the caliber’s functional integrity. More and more women have discovered a penchant for complicated wristwatches, especially those designed and crafted by Patek Philippe according to the finest traditions of horological artistry. They are attracted to the functionality and seductive beauty of chronographs. That is why Patek Philippe decided to initially launch its latest caliber with this attractive complication in a woman’s format. The Ref. 7071R “Ladies First Chronograph” enriches the manufacture’s collection of elegant and intricate watches explicitly designed for feminine wrists. Inspired by Patek Philippe’s Art Deco watches from the 1930s, the Ref. 7071R comes in an elegant, cushion-shaped case with rounded angles. Its inimitably complex form can only be crafted by talented artisans. Its contemporary design is enriched by the warmth of 18K rose gold, the only precious metal in which the case is available. The rectangular buttons that activate the chronograph functions are eminently ergonomic, as is the fluted crown used to wind the movement. The dial is available in silvery opaline or black with a guilloched pattern center. It has two subsidiary dials for the small seconds and for the 30-minute counter. Both sub-dials are slightly offset beneath the center axis of the large hands. This unusual arrangement is emphasized by the asymmetric scales for the seconds sub-dial and the minute counter. Leaf-shaped hour and minute hands in rose gold with luminescent coatings, elongated Roman numerals, the arrow-style chronograph hand, the fine baton hands for the subsidiary dials, and the railway track minute scale assure outstanding legibility. The precious stone complement is as exclusive as the movement: the Ref. 7071R displays 136 full-cut round diamonds that embrace the round dial. Consummately set by master jewelers beneath the slightly domed sapphire-crystal glass, they radiate a fascinatingly prismatic firework of color that compliments the lady’s wrist and adds a gentle touch of feminine mystique to this technical watch. The hand-stitched alligator straps are attached to the case with hinged lugs to assure a luxuriously comfortable fit on any feminine wrist. All external elements – the case, the dial, the strap and the precious stone settings – are designed, crafted, and finished according to the very strict provisions of the Patek Philippe Seal, a unique promise of quality that applies to the watch in its entirety. Extraordinary engineering with an unusual name: the new CH 29-535 PS chronograph movement and the new Ref. 7071R “Ladies First Chronograph” premiered in early November on the occasion of the festive reopening of Patek Philippe’s showrooms in Paris. Established in 1995, the salon is located on 10 Place Vendôme, one of the world’s most illustrious addresses. Now, the showrooms have been enlarged, renovated, and totally redesigned to offer visitors more space, luxury, comfort, and hospitality. The venue in Paris exhibits the same Art Deco ambiance as the Patek Philippe salons in London and New York. Customers and connoisseurs are welcomed on two floors with nearly twice the former floor space. The spirit of tradition and innovation that prevails in Geneva is literally palpable here. While it is a seductive oasis for international clients who visit this exclusive sanctuary of haute horlogerie, Patek Philippe’s Place Vendôme venue also extends a standing invitation to the growing community of watch lovers in Paris and throughout France who are fascinated by its creations.